As young children enter school, they are exposed to many situations that assess their skills, probe at their interests, and, ideally, build confidence. KIPP Minnesota knows that highly effective teachers and leaders are vital to ensuring students experience a breadth of learning activities and are challenged and encouraged throughout. Highly effective teachers are essential to build student confidence and teach skills to excel in school and beyond. KIPP educators are the bedrock of our schools and perform the daily work necessary to prepare our students for choice-filled lives. KIPP North Star Primary (KNSP) art teacher, Ali Bodine, believes art is a way to engage all students and expose them to their own brilliance, especially those who may not be excelling at subjects like reading or math. Ms. Bodine believes that, for many students, art can be the key to unlocking confidence in themselves as a scholar. 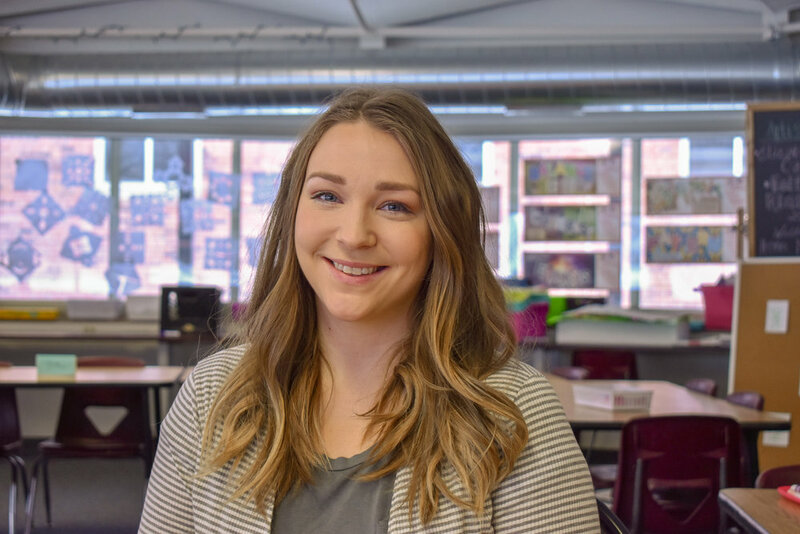 Ms. Bodine grew up in a small town in Minnesota and, upon graduating from Concordia College in Moorhead, Minnesota with a degree in psychology and minors in art and German, she applied to Teach for America (TFA). TFA placed her as a high school art teacher at a school in southwestern Arkansas. Following her TFA term, Ms. Bodine continued teaching at her placement school for five years. Now, she is in her ninth year of teaching and her second year at KNSP. Outside of her role as art teacher of the primary school, Ms. Bodine has taken on multiple leadership responsibilities: she co-led the Black history celebrations at school during the month of February, she is on the Women’s History Month Committee, the Fine Arts Committee, and she was recently appointed teacher representative of the KNSP Family and Community Engagement Committee. But as far as being a principal or assuming a leadership role within the school, Ms. Bodine is not sure she wants to. She has a passion for sharing art with her students, for building their confidence through their unique creative processes, and ultimately, she just loves being in the classroom too much. Highly effective teachers and leaders are the foundation of our schools. Ms. Bodine and all of our outstanding educators are teaching, playing with, learning with, and celebrating KIPPsters every single day. Our students, our schools, and our communities benefit greatly from our amazing educators. Are you interested in impacting the lives of children in our community? Apply to be part of our 2019-2020 Team and Family.